At Billy Goat Moving & Storage in Fort Collins, we’re proud to be your Colorado moving company. We’ve helped countless people make the move from one place to another, all across our beautiful state. While we’re located in Northern Colorado, we proudly serve the entire state, making sure people’s belongings are transported safely from their previous home to their new one. It doesn’t matter if you’re moving to a new apartment across town in Loveland, or you live in Pagosa Springs and you just bought a house in Sterling – we can handle your move! Billy Goat was founded in 2005 by Brandon Fry and Jack Mullins, and with one small truck, we began helping people move. As the years went by, the company moved into bigger and bigger spaces, and added more and more people to the team. With new team members, Billy Goat was able to offer their customers a better and more expedient moving process. With more trucks and more people, Billy Goat was able to expand their services and the team of moving experts was able to reach the entire state of Colorado. Moving can be a stressful experience, especially if you’re moving to a town or city that you don’t know very well. Being able to work with a knowledgeable team that understands how best to carry, load, transport, and unload your belongings can take a lot of the burden off of your shoulders. When you’re ready to schedule your move, the Billy Goat team will help you find a date that works best for you. You may have months and months to plan your move, or you may have to move at a moment’s notice, but whatever the case may be, you can count on them to be friendly and professional from the moment you call. If you’re planning to move in the near future, then why not work with a moving company that serves all of Colorado, and that loves doing what they do? When you rent your first apartment or buy your first house, you can’t wait to move in and get settled. However, before that can happen, you have to find a way to get all of your stuff from where you’re currently living to your new residence. You can always rent a moving truck and drive it yourself, or you can ask friends and relatives to help you transport your belongings. While these are perfectly acceptable options, there is something to be said about hiring a professional moving company. The stress of carrying everything down the stairs and loading it into the truck is taken off of your shoulders, and the heavy stuff is handled by people who move things for a living. At Billy Goat, we can take care of your residential move with skill and precision. One of the reservations that you may have about hiring local movers is that you’re not sure if they’ll handle your belongings with care or treat them with respect. With Billy Goat, you can rest assured that your stuff is in good hands, and that we have the knowledge and experience to properly carry, load, and unload your things. It’s doesn’t matter if you’re moving to a small apartment and have a dozen boxes and a few pieces of furniture, or you’re relocating to a new house and you have several rooms’ worth of stuff – Billy Goat will treat everything you own with care, making sure it’s carried safely and loaded properly into the moving truck. Every piece of furniture will be padded to protect it during transport, and the entryway floors and banisters in both your old residence and your new one will be covered to keep them safe from damage as things are carried in or out. You shouldn’t have to worry about your belongings, or that there will damage to your walls or stairs due to the carelessness of an inattentive mover. With Billy Goat, you’ll get an expert team who knows how to properly move your belongings, no matter how big, heavy, or awkward they may be. Also, there’s never an additional fee for stairs, long walks, or extra stops! When you’re looking for a residential moving company that serves all of Colorado, contact Billy Goat right away. We have the experience you need and the friendly service that you deserve! You’ve put countless hours into turning your business into a success, and that success may have translated into the need for a bigger commercial space or office building. At Billy Goat in Fort Collins, we can help you relocate your company, no matter how big or small it may be. We know how taxing it can be to run a company, manage people, and plan an office move, and that’s why we can take care of all the heavy lifting. Your company is likely filled with valuable equipment, including computers and high-tech machinery, that needs to be handled with care and precision. Our team has experience moving laboratories, hospital departments, law offices, and many other businesses, which means we know how to pack, carry, and transport your valuable items. Instead of worrying about how everything will get from your old building to your new one, you’ll be able to focus on keeping your employees organized and focused during the transition. A lot goes into planning a commercial move, from picking the moving date to figuring how to maintain productivity before and after the transition. It can take time to get a new office set up, and with our help, you’ll have everything in the new location sooner rather than later. We will coordinate with your schedule so that there is as little downtime as possible, giving you the best opportunity to keep your company running smoothly with little to no interruption. When you’re looking for commercial movers in Colorado, let Billy Goat provide you with exceptional service and professional assistance that minimizes your stress and maximizes your company’s potential to expand into its new location. The biggest challenge that many people face before they move is finding time to pack everything in their house or apartment. You may think that it will only take a couple of days to put everything into boxes or tubs, but once you get started, you find that it takes much longer than you anticipated. At Billy Goat, we offer professional packing services, and our team can take care of putting everything in your home into boxes, crates, or whatever moving materials you choose. We will carefully pack and pad everything so that nothing gets damaged during transport, and you’ll be able to focus on getting yourself and your family ready for moving day! We know that you have fragile items in your home, such as delicate china and glassware, and we will always take the time to pack each piece with precision and care. We never take shortcuts when it comes to packing fragile items, so you can rest assured that your grandmother’s china is properly protected. You also have cherished belongings, such as family heirlooms or artwork that means a great deal to you. These precious items will also be handled with care, and with Colorado being such an artistic state, we have experience with packing, crating, and transporting paintings, sculptures, and much more. On top of moving artwork, we can also move your taxidermied animals and other objects that don’t fit nicely into a square or rectangular box. Taxidermy often requires a custom crate, and we can build the perfect solution for your trophy animals. Instead of worrying about your mounted deer head, you can take care of packing your overnight bag and other essentials! Moving can be stressful, and packing can be the one aspect of the move that contributes the most to your stress levels. By hiring us to handle the packing of everything in your home, you can focus on taking care of yourself, instead of worrying about whether or not your belongings are properly packed and ready to go. With most jobs, we can begin packing one to two days before the move. With several team members taking care of the packing, the process can move more quickly than if it was just you and your family. If you live in a small house or apartment and the packing is fairly limited, we can arrive on the morning of the move, pack everything, and load it into the truck. Contact us today at (970) 541-9121 to learn more about our packing services. As moving day approaches, you might be dreading the thought of moving those heavy items in your home, such as a piano or a safe. If you’ve hired a local moving company, like Billy Goat in Fort Collins, then you’ll have the confidence that the movers will be able to carry and transport those burdensome belongings. With our team, you can rest assured that your piano, safe, and other heavy items will be moved safely and effectively. Our motto is, “If it can be moved, we can move it,” and you can rest assured that we’ll take the best approach when rolling your grand piano out the door or carrying your gun safe to the moving truck. You may have invested quite a bit into your piano, including the initial purchase and the regular maintenance to keep it tuned and looking good. If you can’t move your piano into your new place right away, then be sure to ask about our climate-controlled storage options. We can keep your instrument safe until you have the space for it. You bought a safe for a particular reason, either to keep your guns locked away or to protect valuable possessions such as jewelry or a priceless heirloom. Whatever the case may be, you need your safe to be moved from your old place to your new residence. Safes are obviously very heavy, since they’re designed to be difficult to break into. The idea of transporting your safe may be overwhelming, but you can trust us to handle everything with care and precision. You’ll want to take your valuable items out of the safe before the move so that they don’t shift or become damaged during transport. We’ll place the safe in your preferred spot in your new home so that you can deposit your valuables into it, instead of leaving them in your overnight bag. We can also handle commercial safes, so if your office is moving and you have a safe that needs to move with it, we can provide the ideal solution. Above all, we want you to feel confident that your safe is in capable hands, and that it will make it to its new destination. It’s often best to leave the moving of heavy things like pianos and safes to the professionals, and the Billy Goat team has the experience to get your cumbersome belongings to your new home or office building. When you’re getting ready to move, you might be wondering as to how you’re going to fit everything you own into your new place. Perhaps you’re downsizing to a smaller house or apartment, and all of your belongings literally won’t fit into the residence. You can always sell or donate some items, but there will always be those things that you want to hold onto, either until you find a spot for them, or you decide what you’re going to do with them. At Billy Goat, we can help you find the perfect storage options for those belongings that you want to keep, but don’t have the space for after you move into your new home. We have a state-of-the-art storage warehouse in Fort Collins where you can keep your items safe and sound, and they’ll protected from damage, theft, and other hazards. What Unit Sizes Are Available? Whether you have just a few things to store, or you need to store half of your household belongings, you can choose between two different storage unit sizes. You can pick an 800-cubic foot unit that measures 10 feet wide by 10 feet long by 8 feet high, or you can go with a 1600-cubic foot unit that measures 10 feet wide by 20 feet long by 8 feet high. If you only have a few boxes or small pieces of furniture to store, then the 800-cubic foot unit will probably suffice. If you have large items, such as couches or a mattress, then the larger until will likely be a better option. Our moving and storage team will gladly help you choose the best unit for your needs, and we’ll of course move everything into the space for you! If you’re not moving to the Fort Collins area, then storing your things in the city might not make the most sense. You’d rather have a storage unit that’s closer to your new home, making it easy to put things into the unit or take them out. Our team has extensive knowledge of self-storage facilities throughout Colorado, and even if we’re unfamiliar with the area, we’ll do our best to find an affordable and suitable option for your belongings. Once you’ve chosen a storage space, we’ll move your things into it so that you can focus on settling into your new home. There’s no extra charge for making a stop at your self-storage unit while on the way to your new house or apartment, no matter where in Colorado it may be! More than anything else, we want you to feel confident that you’re items are secure, no matter if they’re in our warehouse or in an off-site facility. If you need to move out of your old place, but can’t move into your new one right away, then storage often makes the most sense. Billy Goat has the knowledge and the capability to help you find the best option for your and your family. If you have questions about our storage options, then please contact us today. You can also get instant rates by clicking on the banner below! At Billy Goat Moving & Storage, we want to be your trusted team of local movers, no matter where in Colorado you may be moving. We understand that moving can be stressful, and that you may need to move sooner rather than latter. Whatever the circumstances, you can count on us to move your things to your new home with little to no trouble at all. If you have any questions or concerns along the way, we’ll be more than happy to help however we can. Whether you’re looking for a new home, or you need to relocate as soon as possible for work, you can trust Billy Goat to handle your move. You can use the form below to contact us, or you can call us at (970) 541-9121 to speak with a member of our team. 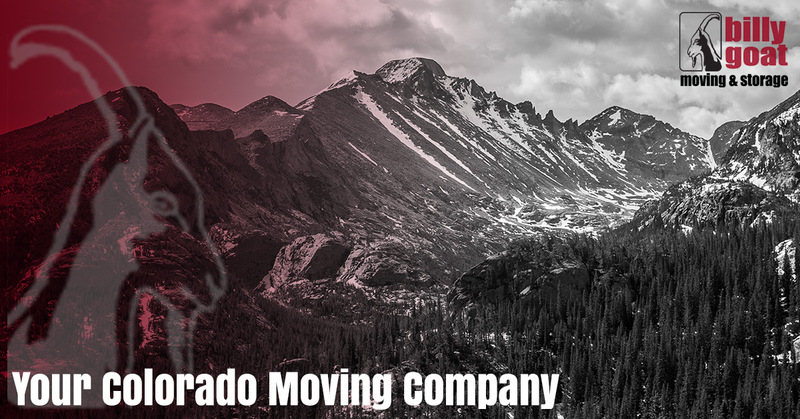 Above all, we want you to feel satisfied with your choice to use us as your Colorado moving company. Planning a Spring or Summer Move?